Every time someone asks me what my favourite cuisine is, I’m stumped. If the pressure is on I’d have to say it’s a tie between Thai & Korean Cuisine. For as long as I can remember, I have always loved experiencing food from all over the world. I’ve been stopped in supermarkets by shocked people wondering how the heck I know what Pierogi is. I’ve also had fascinating conversations with Koreans about Korean food and culture. There’s something about trying different cuisines that makes me instantly feel well-travelled. It’s one way to feed my wanderlust nature. As someone who enjoys cooking different cuisines from all over the world, I appreciate it when a brand such as Glorious! Soup caters to a global food experience. They have a way of creating the most authentic flavours and placing them in to the most delicious soup you’ll ever taste. They have such a wide range of soup so you’re bound to find something you love. Soup really is a labour of love and you can tell a lot of thought goes into each Soup they create. Every time I make a selection at the supermarket it really does feel like I’m embarking on a global soup adventure and I love it. Today I’m going to be sharing my take on a simple Thai noodle soup with the help of Thai Tuk-Tuks & Turmeric soup by Glorious! Soups; (I love the cool and quirky name). This fragrant carrot soup is bursting with flavours of coconut, lime leaves and lemongrass. This heartwarming soup is great as is, but to take it up a notch and turn it from a super light dinner or starter into something a little more filling, I decided to incorporate it into a noodle soup recipe. It’s fragrant spices with a hint of heat make this the perfect end of summer dinner. This is the perfect soup for any time of year but I especially like it for his time of year when Summer is ready to say goodbye, the rainy days have returned and the chilly nights have found their way back. No matter what kind of day you’re having or what the weather is like you can always guarantee that a comforting bowl of soup will make you feel satisfied and snug. First, make the rice noodles. Follow the packet instructions as it is different for all types.My batch was 100g and only took 5 mins. It made enough for 4 portions. Taste and add addition spices and herbs to enhance the flavour. I added chilli flakes, garlic puree, ground lemongrass and a pinch of salt. If you are using fresh lemongrass, bash it a little to enhance the flavour and take it out before serving. Serve noodles in a bowl, top with the soup and finally garnish with a few freshly sliced chillies, coriander and a wedge of lime. It’s not photographed but I did add a splash of chilli oil too! It’s so vibrant, satisfying and packed with Asian aromatics. It honestly is a terrific noodle soup so definitely give it a go and let me know how you find it. 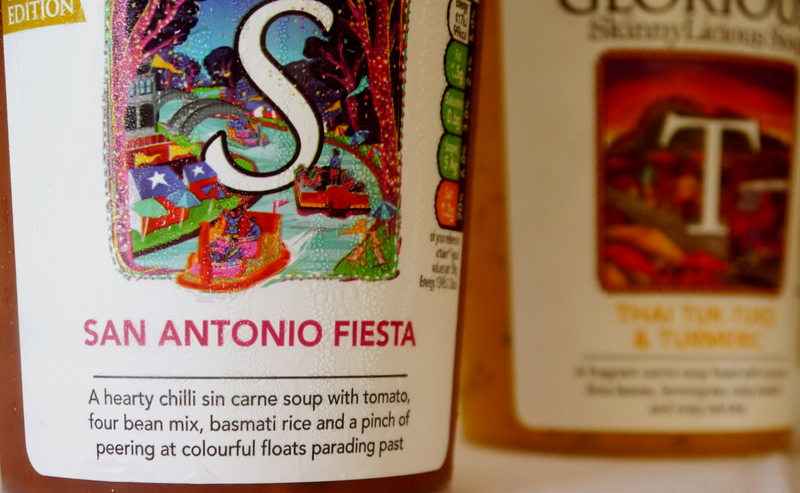 I’m looking forward to my next global adventure which I’ve already decided is going to be Glorious Soups San Antonio Fiesta! Have you tried Glorious! Soup? Which one is your favourite?